Community takes over city council meeting to demand justice for Cordale Handy | Fight Back! St. Paul, MN – Dozens burst into the city council meeting here on Wednesday afternoon, March 22, to demand answers after the police killing of 29-year-old African American, Cordale Handy. Swift stepped up to the microphone to recite demands from an open letter to the council, co-signed by Black Lives Matter-Saint Paul, Blue Lies Matter, Communities United Against Police Brutality, Justice for Marcus Golden, Saint Paul for Justice, and Twin Cities Coalition for Justice for Jamar. In less than a minute, most of the council members got up and left the meeting, only three staying behind. 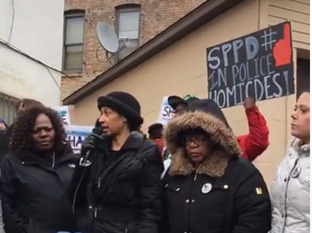 Demands include: release of all video and audio evidence; an independent investigation not conducted by the BCA; an end to the smearing of Mr. Handy’s character; and an end to the practice of paid administrative leave for killer cops. While council members claimed most of this was out of their hands, Council President Russ Stark agreed to the demand for a community meeting to address Handy’s case, and why the Saint Paul Police Department has become the most lethal department in the state. It was agreed the meeting would take place within two weeks at the High School for Recording Arts. Several others spoke at microphone, including Kay Smith, wife of Jaffort Smith, and John Thompson, friend of Philando Castile. Smith and Castile were both murdered by local police in 2016. The cops that killed Jaffort Smith with 19 shots were let off by a grand jury, while Castile’s killer is awaiting trial for manslaughter. Cordale Handy’s case, along with those of Jamar Clark and many others, will be on the agenda at a community forum hosted by the Twin Cities Coalition for Justice for Jamar at 3 p.m. on Saturday, March 25, at Redeemer Lutheran Church in North Minneapolis. Speakers will include Frank Chapman, of the Chicago Alliance Against Racist and Political Repression, members of Minnesota Immigrant Rights Action Committee (MIRAC) No More Deportations Campaign, Communities United Against Police Brutality, and the IWW General Defense Committee. The forum aims to bring together community members and activists to discuss strategies for confronting police crimes today.